Oh dear, I am glad my thrifting went better than my picture-taking this week. Today was a cloudy, grey day not at all good for taking pictures of my treasures. Then when I finally rigged up a kind of light, my camera battery died. I did manage to get a few shots of some of my treasures. Not all of them, but a nice sampling. I am cheating including the pillow in the background. It was a thrifty find, but I found it months ago. I thought it added some needed colour. Can you see the trend? More red! 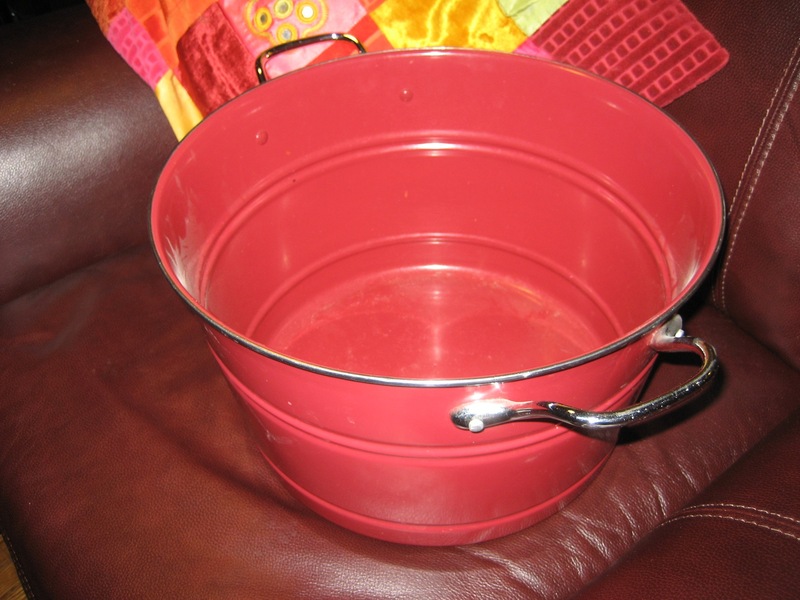 I just about knocked some poor man over when I spied the red metal tub. Got it for $5.00 and it still had a price tag on the bottom from Pottery Barn – $59.00 ! Score! OK I will cool it with the exclamation marks. I plan to fill it with balls of wool by my knitting chair. The two little tins are sweet. Sorry about the glare, I will get better at these photo shoots. 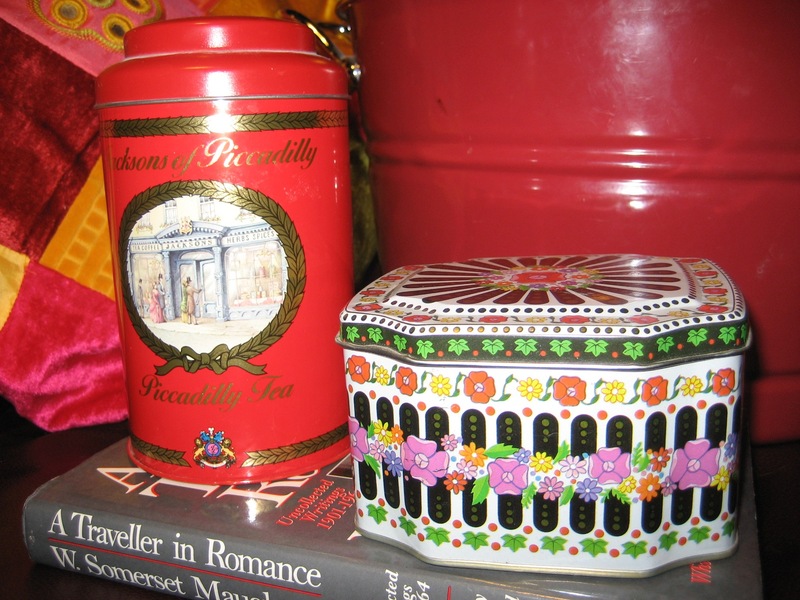 The red one says Jacksons of Piccadilly Tea. 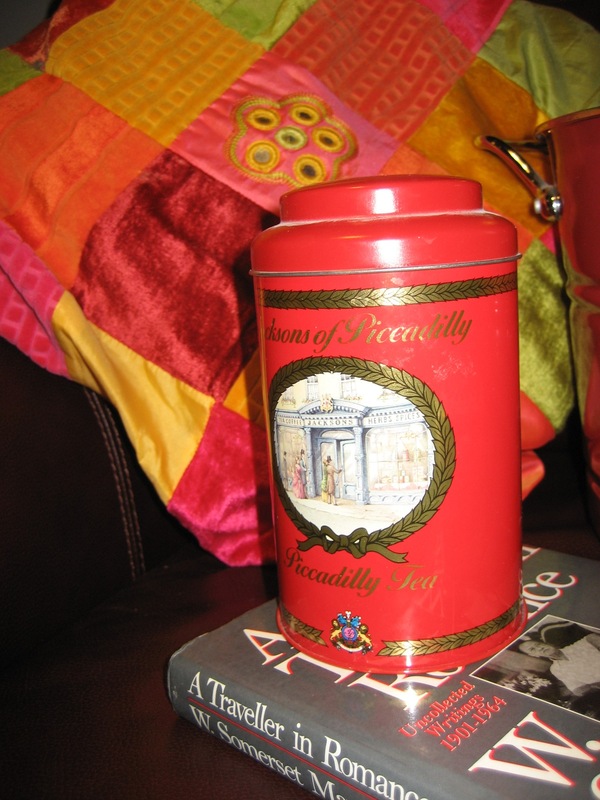 I plan to keep tea in it … the other one is just too cute and was 50 cents, maybe good for little sewing things. Not much better. I was very happy to find a copy of A Traveller in Romance Uncollected Writings 1901 – 1964 by W. Somerset Maugham. I am a huge Maugham fan and there are not many I don’t have. I also picked up a couple of other books, a novel that looks good, and a Company’s Coming cookbook – Stews, Chilies and Chowders. They always have good recipes and I have several bookmarked to try this weekend. Porcupine Meatball Stew anyone? This is really the one I am most excited about. I found a cute little wooden box I hope to rehab a bit and a shelf I will use to display some goodies, and some more cutlery, but sadly no pictures. Maybe next week! Mrs Murfin you are a genius….I LOVE your blog……so much better than facebook….I just can’t get excited about facebook. Seeing your pictures and reading your words is like being right there with you. 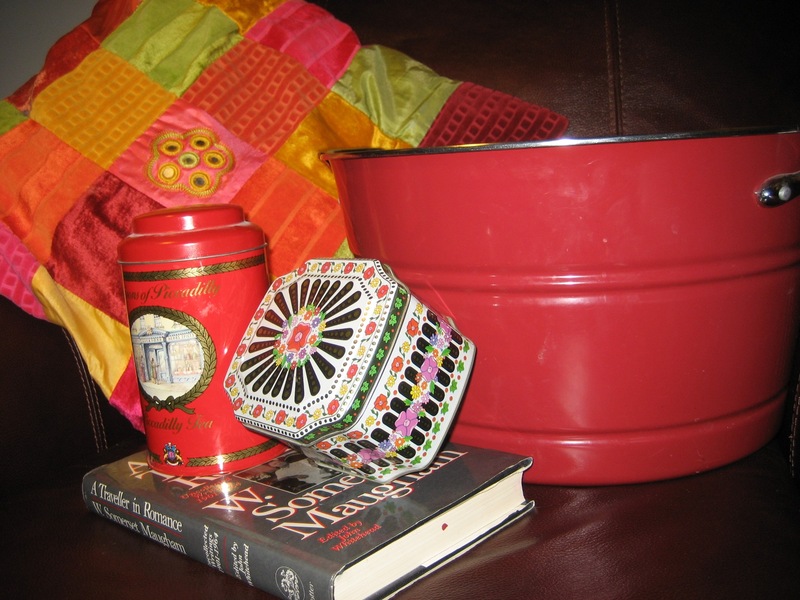 When I saw your topics…books,dishes,colour,quilts,crafts,thrifting and CAKE….Wow. All of these things are my favorite things too. Can’t wait to see what you post next. Thanks! I am having fun so far. It is nice you can keep up to date on the happenings here. Love the tins, very jealous of the redmetal tub, and would probably be very very jealous of the wooden box if I saw it, as I have a weakness for old wooden things. I also have a weakness for pitchers, especially those with an interesting shape and baskets. Can’t wait to see these things in their place in the new homestead! Ha! I will post a picture of the shelf and … the new pitcher I bought too!